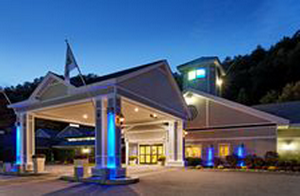 Conveniently located off Exit 7, I-91 and a terrific choice for one or more nights! 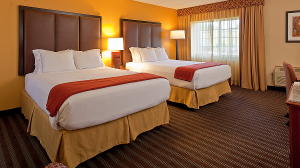 The Holiday Inn Express Springfield offers 88 non-smoking, well-appointed guest rooms with coffeemakers, microwaves and refrigerators, five handicapped accessible guestrooms, free wireless internet access, a large indoor heated, salt water pool, fitness center and guest laundry facilities. Not just your average spread, our complimentary breakfast is a hot buffet featuring several delicious items like scrambled eggs, sausage, bacon, fresh fruit, assorted yogurts, fresh pancakes and cinnamon rolls. You will start your day off satisfied! We are only a short distance to many popular attractions in south/central Vermont like the Vermont Country Store, Fort at No. 4, Hildene (home of Robert Todd Lincoln), and Ben & Jerry’s to name a few! Groups can also pre-arrange for baggage handling in and out, and a tasty welcome reception. Groups are based on 10 or more rooms and are subject to a 9% VT tax. We look forward to hosting your group while you tour or pass through the beautiful state of Vermont!